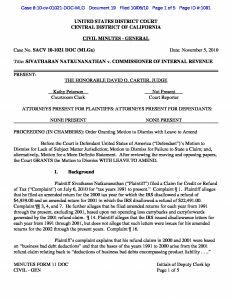 Natkunanathan v. United States – Federal District Court litigation resolved through successful motion work on issues of bad debt loss and statute of limitations on a refund claim. Affirmed by the Ninth Circuit at 110 A.F.T.R.2d 5201; 474 Fed. Appx. 603; 2012 U.S. App. LEXIS 14284; 2012-2 U.S. Tax Cas. (CCH) P50,458 (9th Cir. 2012) (designated as unpublished by 9th Cir. but citable per Fed. R. App. P. 32.1).